The quilt project is spearheaded by Jenifer Lawrence Martinez of Steampunk Garage and Lis Guy of Linton Creations. 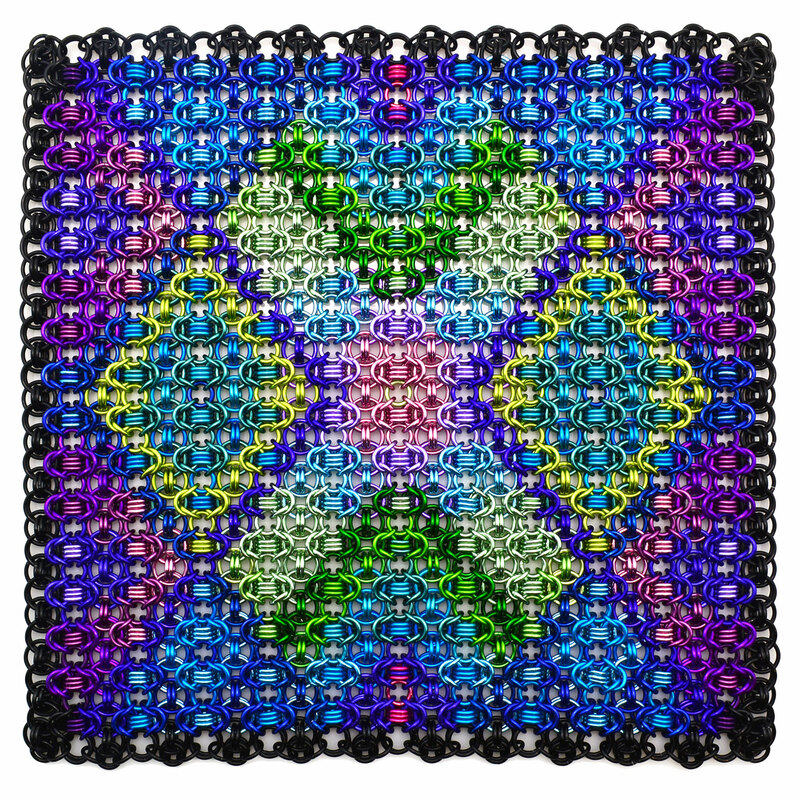 One main purpose of the quilt is to showcase the diversity of chainmaille – the seemingly infinite number of designs that can be created from various colors, metals and weaves in this medium. 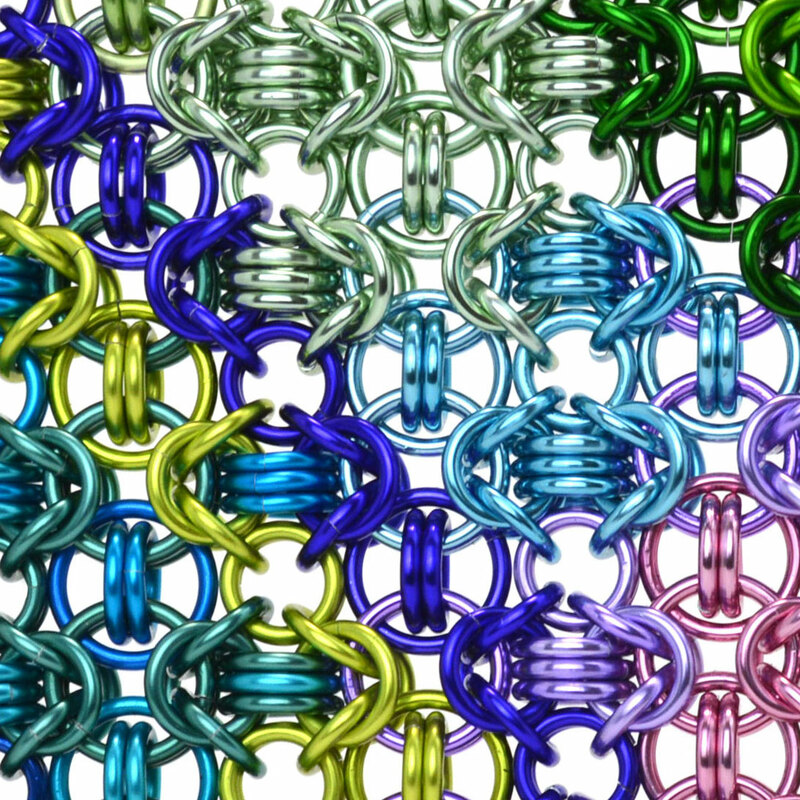 You can keep up with the quilt’s progress in the dedicated Facebook group The Chainmaille Quilt – Started 2018. If you look through the 70 patches posted as of this publication (with dozens more patches to go! 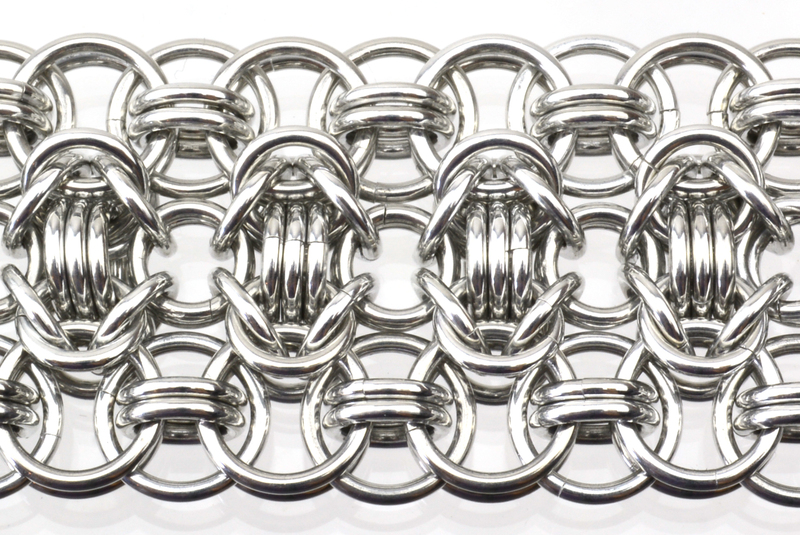 ), you’ll develop a newfound appreciation for the versatility of chainmaille. When I heard about the quilt, I knew I wanted to contribute. But first, I needed to figure out what to make. The requirements set forth by Jen and Lis are purposely very free and open: essentially, so long as each patch fits into an 8″x8″ square, is strong enough to handle weight and pressure from the rest of the quilt, and doesn’t closely duplicate an already submitted patch, the artist has free reign.is! 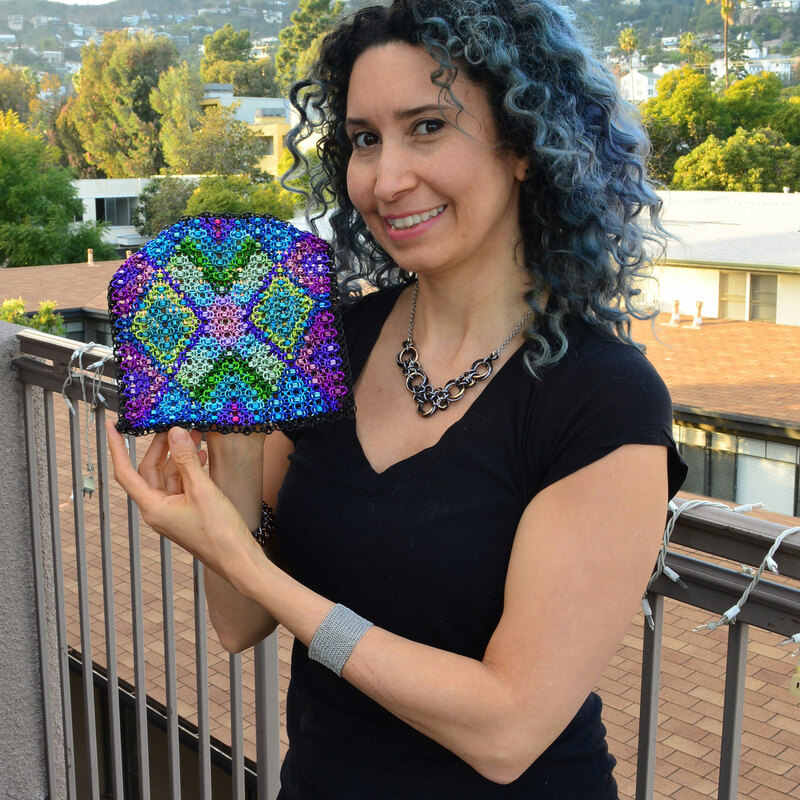 That wasn’t surprising to me, since Rondo a la Byzantine has consistently been one the most popular patterns we sell, and it was also featured in my book CHAINED. So, Rondo a la Byzantine it is! First, I needed to see if the ring sizes I had in mind (Blue Buddha’s H18 and N18) could be used to make a sheet version that was close enough to 8″x8″ without needing all sorts of crazy edging. I did some rough calculations based on a bracelet I had, and it seemed like it would work, but I wanted to render a life-size illustration to be safe. Plus, I knew I’d need to put together a mockup in order to figure out my color pattern, so this was a way to tackle both these projects at once. 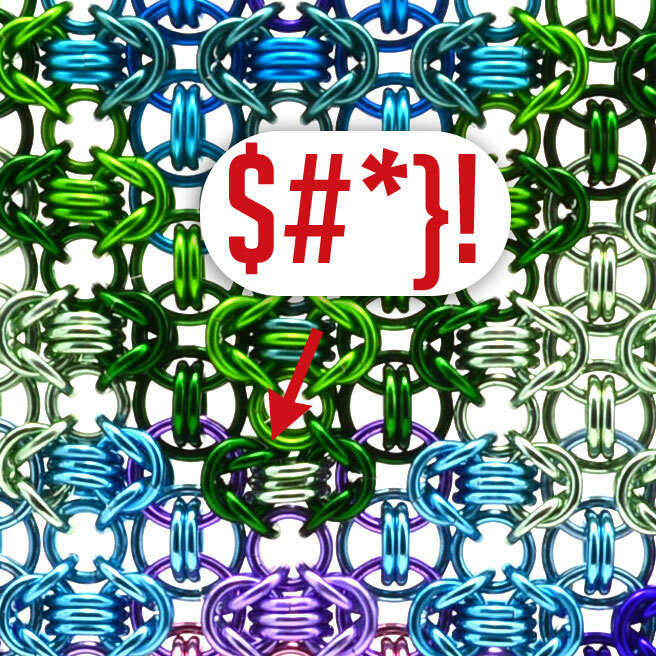 Looking through the old photo files for the original Rondo a la Byzantine tutorial, I found an image that was exactly what I needed: a small, uncolored section of the weave. After lots of copying and pasting in Photoshop, I wound up with this image. I adjusted the size so that the printout would exactly match the real life version … and much to my astonishment the square measured in at 8″ x 7.9″. Woo-hoo! Now that I knew the weave would work in theory, I needed to test it using actual rings. This part was important because I had lots of rings from different vendors, and sometimes the different suppliers’ components don’t play nicely together. I was also mixing two gauge systems, which is usually OK, but every now and then things get finicky. 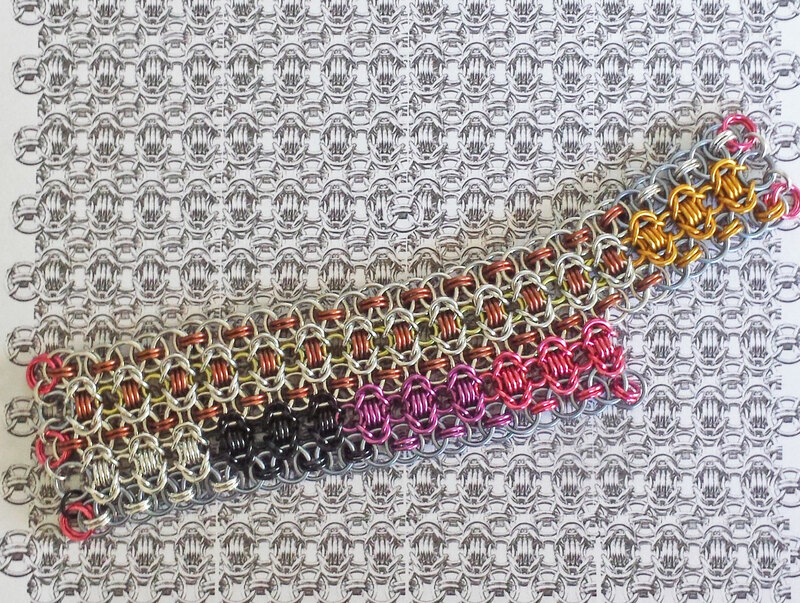 I already had a bracelet sample of Rondo a la Byzantine, so I removed the clasp, extended it to 8″ and then added a second row, using rings from various suppliers in various permutations, just to make sure any combination I might want to use would work. 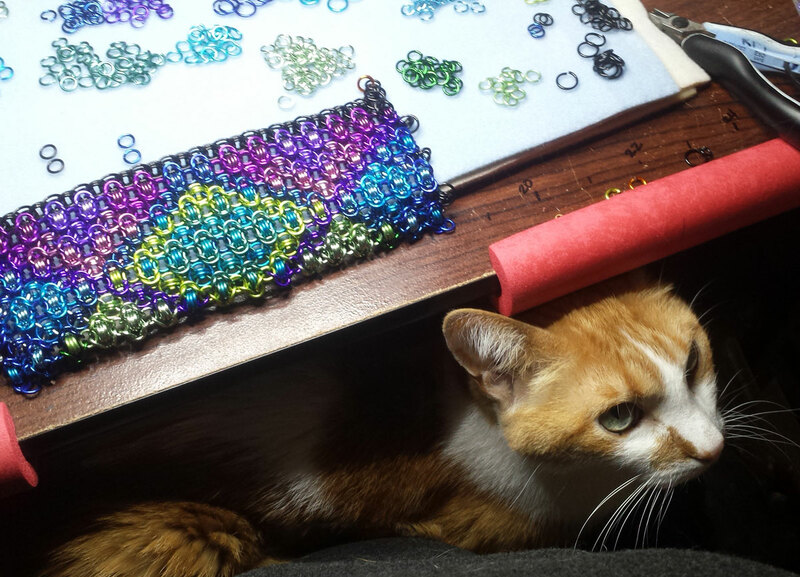 The next step was to figure out my color pattern, so I could order any rings I didn’t already have in my stash. 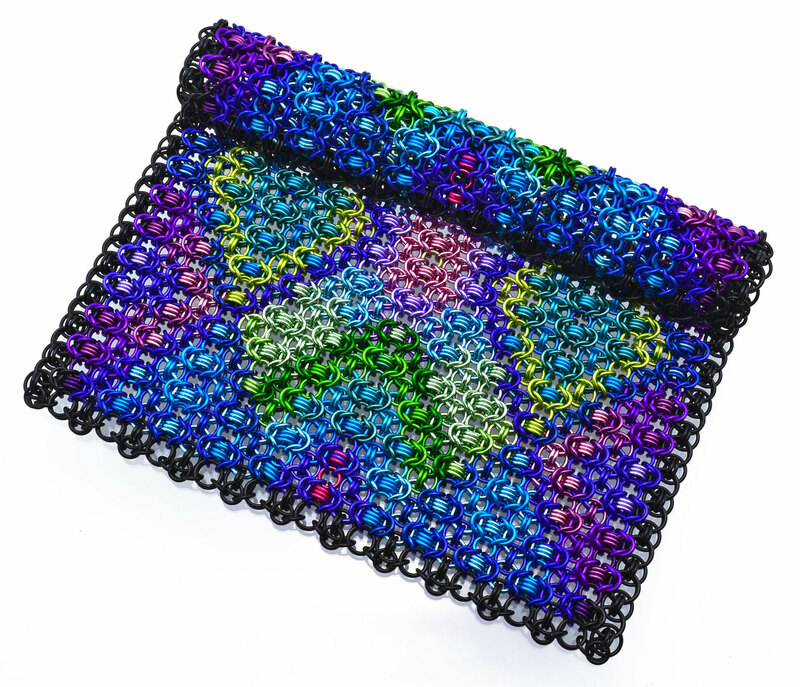 This was definitely time-consuming, but well worth the effort, because I would not have been able to weave such an intricate pattern without any planning. 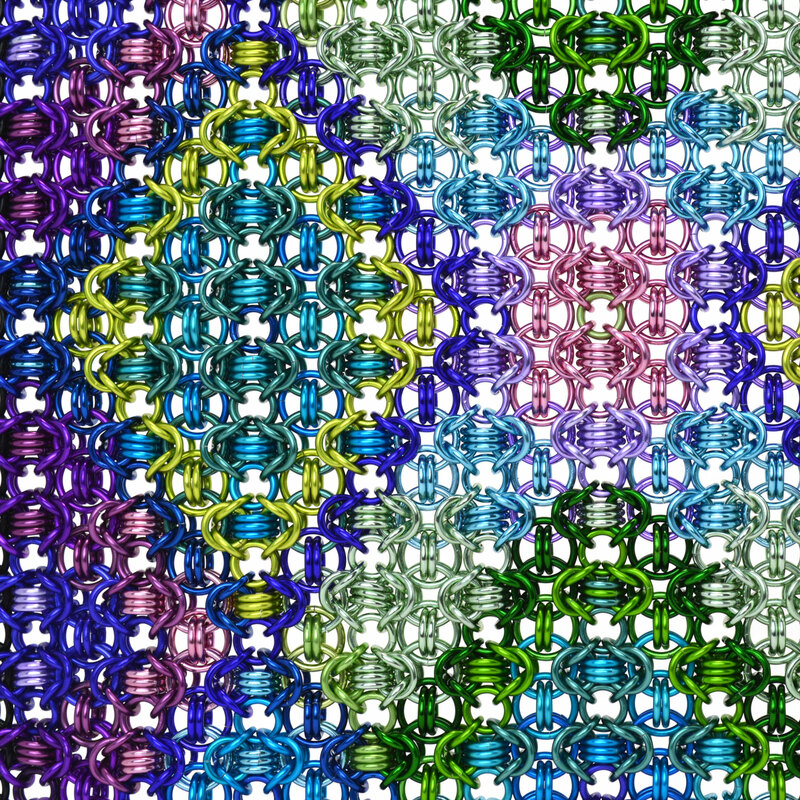 I wanted to use lots of color and also have a vaguely fractal-esque diamond-shape pattern. After pretty much a full day’s work (spread over a few days) in Photoshop, I was satisfied with my design. 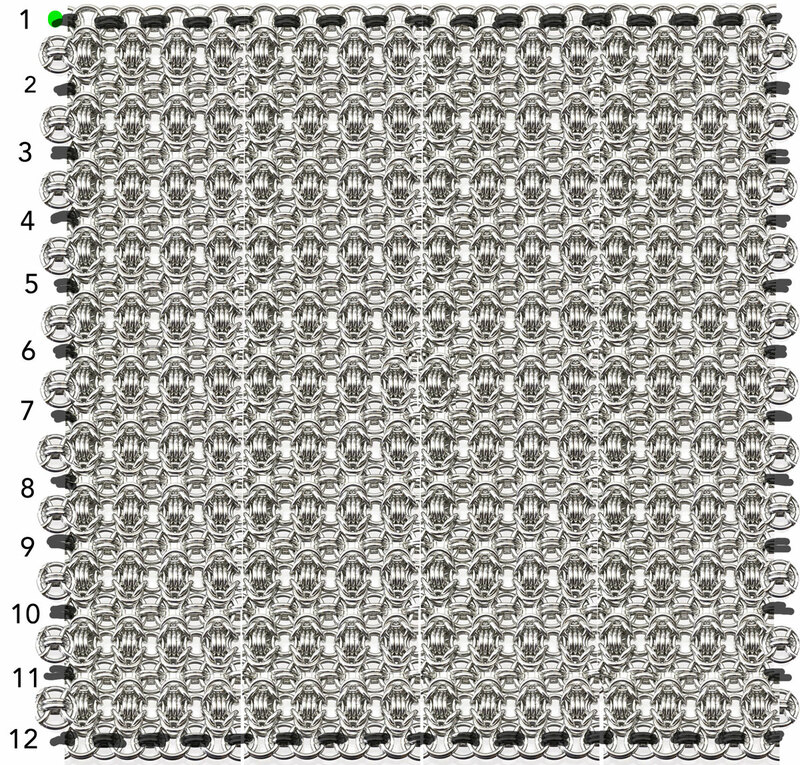 There are two main ring sizes used in this weave. For the large ring size, there are two positions (doubled rings vs singled rings). Each of these is in its own group in Photoshop, allowing me to create printouts of a single ring size. The large-ring printouts in particular were helpful as I wove, because it would’ve been too difficult to try to ascertain each ring’s color in the master printout above, especially for the single large rings which are essentially buried beneath all the other rings and difficult to see in the master printout. 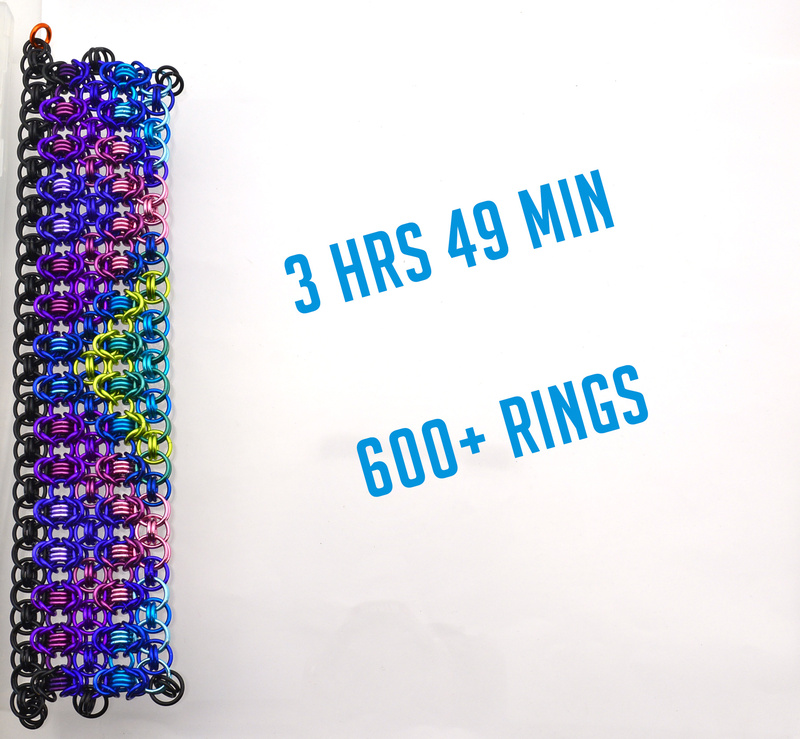 The isolation was helpful when tallying how many rings I needed in each color/size. It also helped me clarify a color if I couldn’t distinguish between closely-related colors on the printout. I was already well into the design process before I realized that I could’ve also just colored a design for a single quadrant, and then copied and pasted—flipping horizontally and vertically as needed—in order to create the full patch. It would’ve saved a LOT of time trying to accurately color everything in. I took this approach on my next project (yes, I’m making another one of these squares, just because 😂). 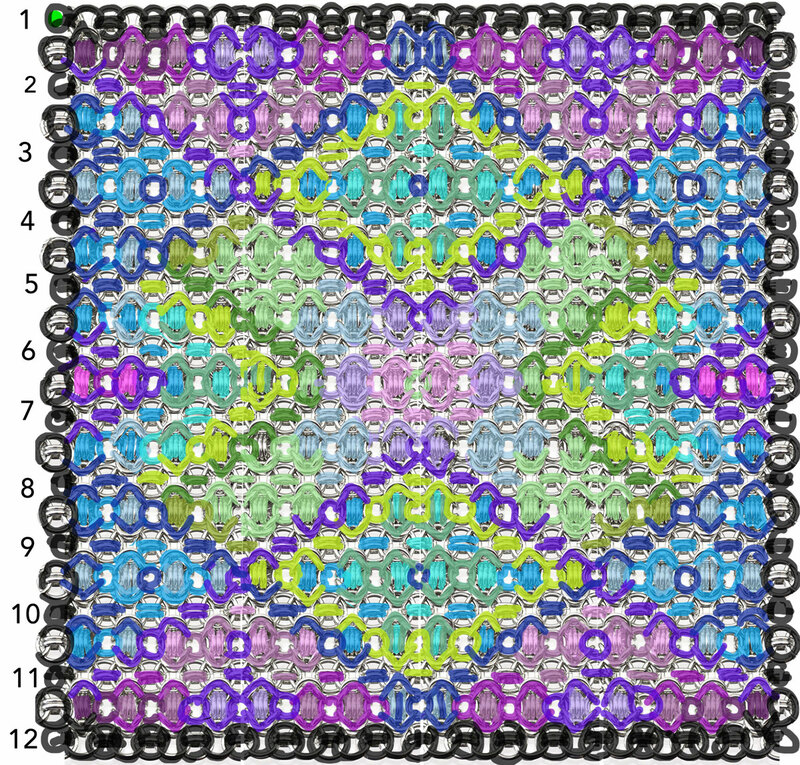 It definitely saved time and improved accuracy, though I learned something else: my brain isn’t very good at predicting what the complete design will look like once the quadrant has been mirrored along both axes of symmetry. I wound up periodically pausing to copy and paste the quadrant-in-progress into the full patch in order to see which design elements weren’t satisfying. Then I’d could go in and make tweaks before continuing. I’d guesstimated it would take about 20 hours to complete my patch, and I had a week in which to finish in order to make the soft deadline to have the patch on display at the national Chain Link Up gathering in Tennessee in March of 2019. The first day, I made substantial progress and knew I’d be able to finish in time, unless some unforeseen disaster came up. By day 2, my supervisor had comfortably settled into his spot. Here’s an image that shows what the piece looked like about halfway through, laid on top of the master printout. It was at about this point I started adding the finishing rings to the edges (along the bottom and top of the piece as laid out below). This helped create a more flush edge, rather than the jagged lines of the original pattern. And so it continued, ring by ring, row by row. At the end of the week, it was finished! As you can see, the quilt can be tightly rolled in one direction. 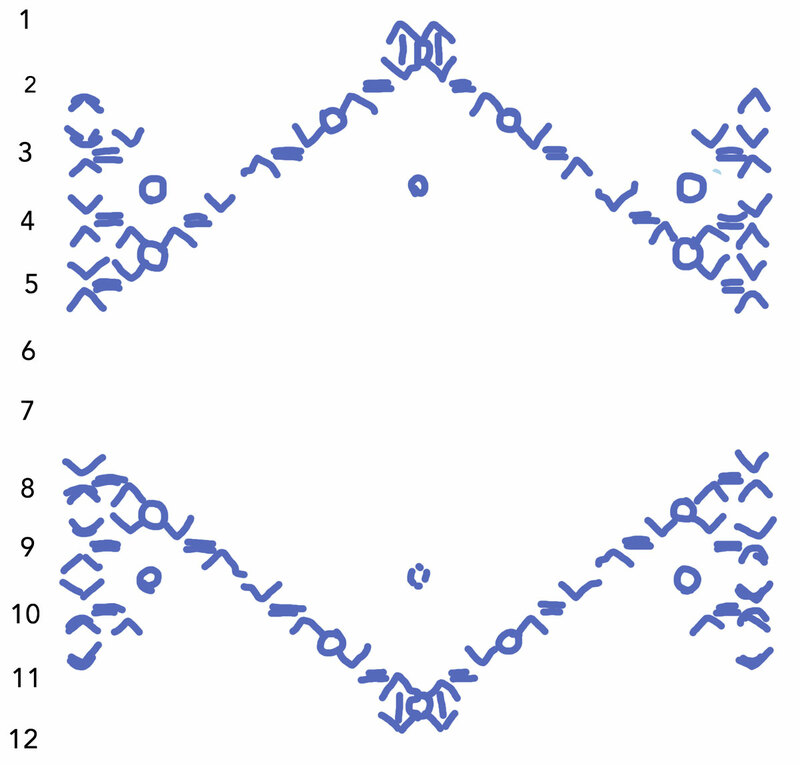 This is the direction that needs to be flexible to comfortably wear a Rondo a la Byzantine bracelet. 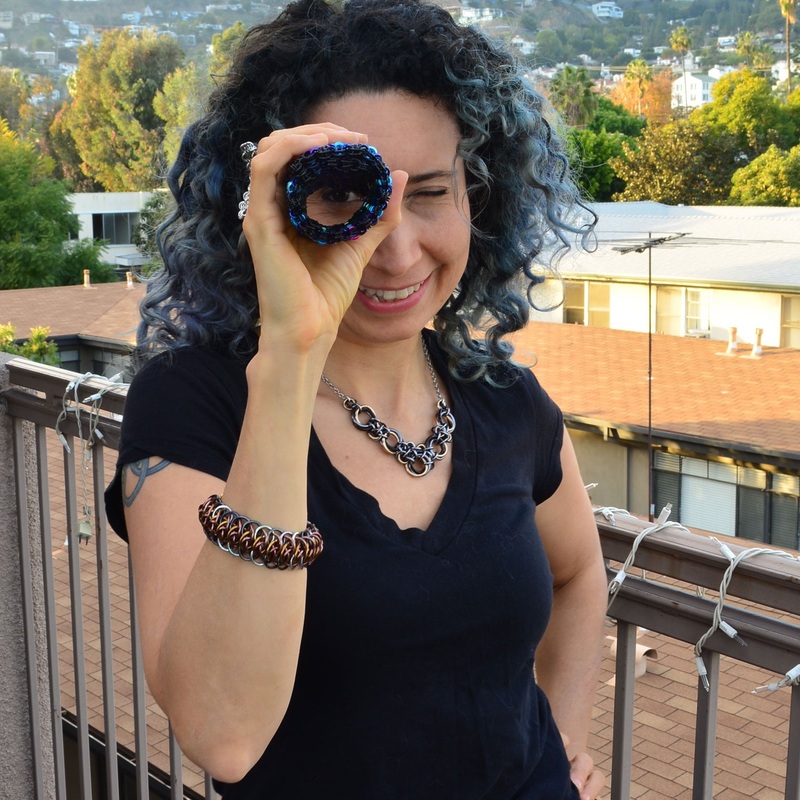 As I was sorting and editing the photos of the finished piece, much to my chagrin, I noticed an error! 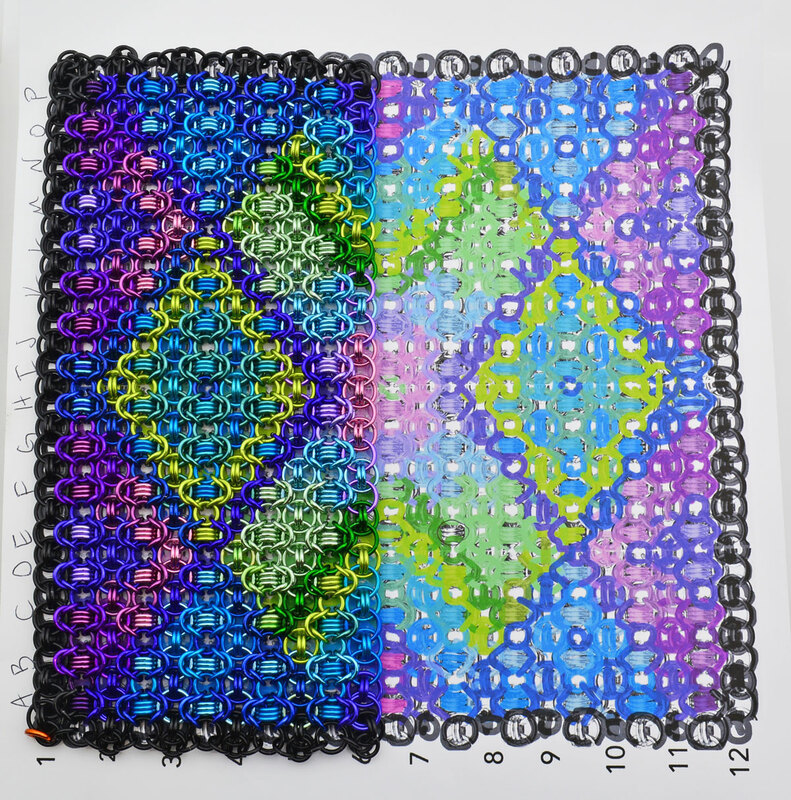 Truthfully, I made other errors as I wove (usually a wrong ring color, but there was one row where I put three rings in the wrong place, and after the third, I knew it was time to call it a night!) I definitely wove this project much slower than normal, because I had to check each and every ring to make sure it was the correct color. All in all though, I’m quite satisfied with how few mistakes I made and also the overall speed in which I was able to work. Looking at the weave close up is extremely satisfying to me. Seriously, this photo makes me smile each and every time. Note: You can purchase jump rings in these sizes in the B3 Etsy shop to make your own Rondo a la Byzantine piece. If you’re a chainmailler who has contributed to this project, feel free to leave a comment below and let us know about your patch!